Not happy with their current situation, Paul and Audrey Safranek decide to shrink themselves to about five inches tall in a procedure known as "Downsizing" when they discover their rather modest level of equity will translate to an extravagant wealth when they are shrunken. When Audrey backs out at the last minute, it leaves Paul tiny and looking at the world in a whole new way. The world is in trouble, the human race is in trouble, and we are all too lazy to do anything about it unless there is some form of economic benefit in it for us. There, we just saved you two hours so now you don't have to watch any hamfisted storytelling. "Downsizing" is directed by Alexander Payne, who has a tremendous track record up until now, directing such films as "Nebraska," "The Descendants," and "Sideways." He also wrote the screenplay along with Jim Taylor, who has worked with Payne numerous times in the past on films like "Election" and "About Schmidt." This film stars Matt Damon as Paul Safranek, an occupational therapist at Omaha Steaks. He and his wife Audrey, played by Kristen Wiig, want to get a better home and improve their situation in life but are struggling to afford it. Some years back, a Norwegian scientist, played by Rolf Lassgård, developed a process called "downsizing," which can reduce the size of organic matter exponentially. This was done as an effort to combat environmental issues caused by the human race, such a global climate change and food shortages due to overpopulation. In reality, most people go through the downsizing process simply to better their station in life since a dollar stretches much further when you're only five inches tall. Everything looks good for Paul, but his plan is turned upside down when his wife backs out at the last minute, leaving him single, unsure, only five inches tall. We have liked many of Alexander Payne's previous films. Many of the movies listed above turned out to be in our top 10 or 20 the years they were released. 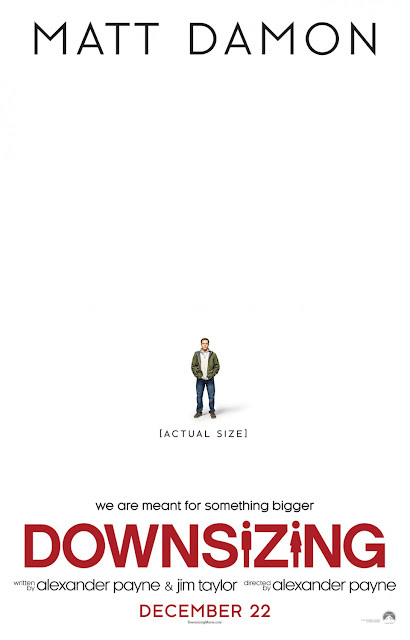 Because of this, it is all the more disappointing that "Downsizing" winds up being a boring slog of a film. We are fine with movies that contain messages about saving the environment, and we even agree with the sentiment being put forth in this film. That being said, it is delivered in a very clumsy, dull, inept manner that the longer we sat in the theater, the more we wanted to buy an F-250 out of spite. "Downsizing" sort of hid its actual themes and agenda from the public in its marketing material. It was sold as a light comedy about the wonders of "getting small" and how people adjust to a miniature world while finding out even the small world has its problems. What it actually is is a satire meant to critique the laziness of those with good intentions and the fact that people won't do anything unless there is a financial benefit. As expected, the arguments around downsizing fall into partisan politics of the "big" versus the "small" and how small people hurt the economy of the big people and so forth and so on. The argument is never what's best for mankind and the planet, but rather how will a person's actions impact another person's wallet. All of these are good ideas in theory, but the execution is handled so very, very poorly. Add that to a less than stellar performance on the part of Matt Damon and you've got a recipe for disaster. As Paul Safranek, Matt Damon is essentially the "every-man" character, but he does so as lazily as possible, making his character devoid of wit, charm, or interest. The talents and charisma of actor Christoph Waltz are stifled in favor of a terrible French accent and boring characteristics. And Hong Chau, don't even get us started on Hong Chau's Ngoc Lan Tran, a Vietnamese dissident with an accent so stereotypical it gives Mickey Rooney's a run for its money. Though she brightens the mood with a couple of well-timed jokes, it's painfully obvious her only on-set direction was something to the effect of "be more Asian." It was painful to watch. Having heard Chau on talk shows hyping the movie in preparation for the Golden Globes and her nomination for Best Supporting Actress, we know she sounds nothing like her character here. If we're being honest, we had major secondhand embarrassment knowing this sort of thing still manages to happen in 2017 (but then again, this has been a crazy f**king year, so we guess we shouldn't be surprised). When a filmmaker is trying to deliver a message, they can't make it look like they are on a soapbox. It's like trying to feed a dog a pill it doesn't want to swallow. You have to wrap it in something enticing, like a piece of cheese. Unfortunately, the cheese Alexander Payne wrapped his "Downsizing" message in is old, dry, and covered in mold. Despite some great visuals, the film is an utter disappointment full of banal dialogue, uninteresting characters, an overlong runtime, and a pseudo-smart plot.